There’s nothing more exciting than finally realizing we are at the cusp of a new season. With winter finally drawing to a close over the next few weeks, we’ve begun looking toward the future — a warm, sunshine-filled spring-y future! The only thing worth getting more excited about than the prospect of warmer weather? A wardrobe filled with stylish staples that will keep Us shining from this season to the next. Surely, there is no better time than the present to brighten up our closets, with some fun and fresh options and fortunately, we’ve found the best sale to whip our wardrobe into shape! We’ve rounded up five of our favorite fashion picks that will not only help us survive the rest of this not-so-wonderful winter but spring us into the sunnier seasons ahead! Step into style in the Delaney Signature Buckle Heel Bootie. 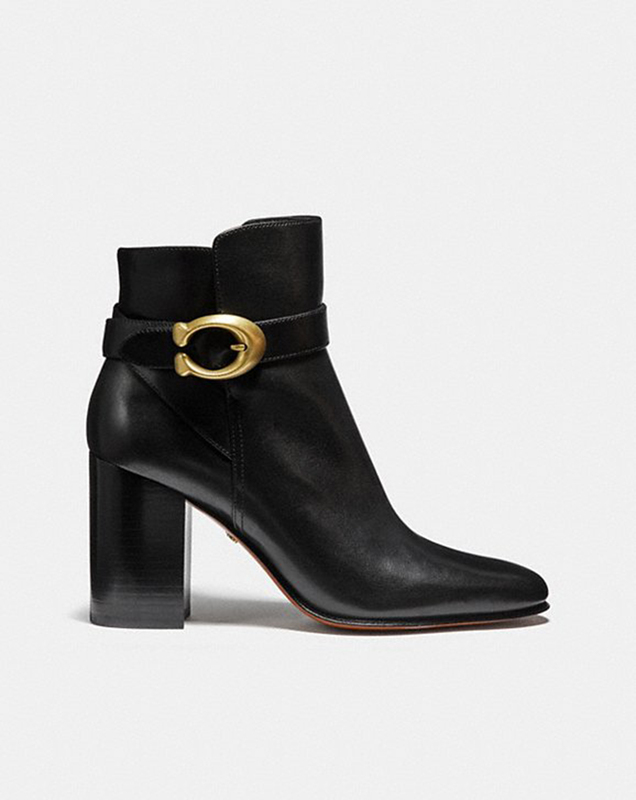 We can’t help but call it the new LBB: Little black bootie. The Delaney is crafted with smooth leather and an ever-so-chic buckle belt. The sophisticated silhouette even features a leg-lengthening block heel. We can’t help but wishing we were already pairing these adorable booties with minidresses or even a white tee and a pair of denim cutoffs! One thing is certain, shoppers will strut in style with these adorable booties! See it: Grab the Delaney Signature Buckle Heel Bootie (originally $325) now only $163 while supplies last, available at Coach! We’ve already mentioned the LBB, so it’s only fair we also mention another fan favorite: The little black dress. The Tie Neck Flare Dress is the lightweight and slight sheer option that’s perfect for shoppers that are looking for something that is not only trendy-but-traditional option. The dress features a high, ruffled collar with a rich velvet tie and a flounced hem for a voluminous, and airy effect. We can’t help but think how perfect this will be with a pair of strappy sandal on warm weather, or paired with tights and booties for chillier days! See it: Grab the Tie Neck Flare Dress (originally $495) now only $248 while supplies last, available at Coach! Sensitive, smart and sleek? The Sculpted Signature Tech Glove is not only the trendiest tech we’ve ever seen but an actual trifecta! The stunning soft cashmere glove is crafted with supple leather and finished with the brand’s signature hardware. The tech gloves feature a touch-sensitive thumb and forefinger which makes it easy to touch our smartphones/devices all while staying warm. Sensitive, smart and sleek? See it: Grab the Sculpted Signature Tech Gloves (originally $142) now only $73 while supplies last, available at Coach! 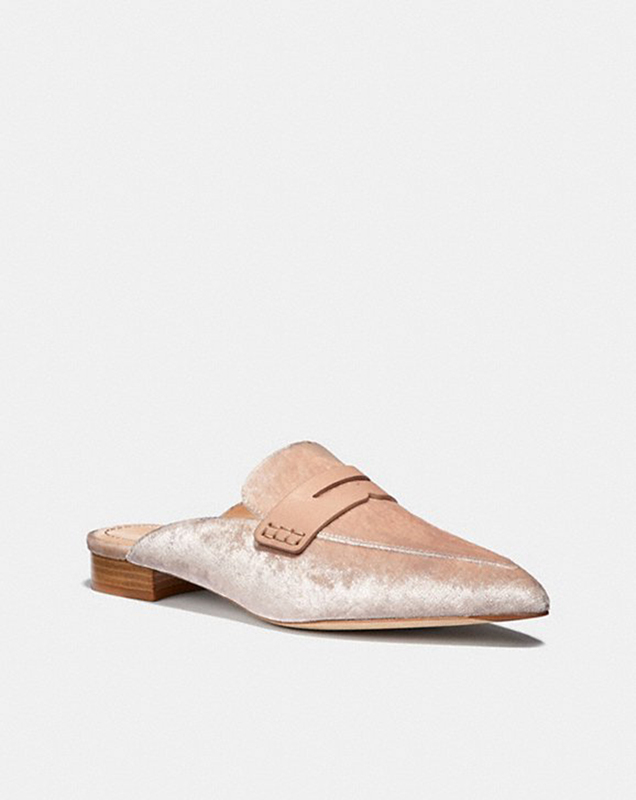 The Nova Loafer slide is the only shoe that we want to slip into every and all season! The loafer-slide is the perfect mashup between a loafer and a slide and is featured in the luxurious velvet. How chic and ever-so versatile! See it: Grab a pair of the Nova Loafer Slides (originally $175) now only $88 while supplies last, available at Coach! Life’s not a popularity contest but if it was, we’ll be winning in this stylish staple! The varsity-inspired jacket will make shoppers first in class with this spirited-yet-authentic jacket! It is equal parts trendy and traditional. 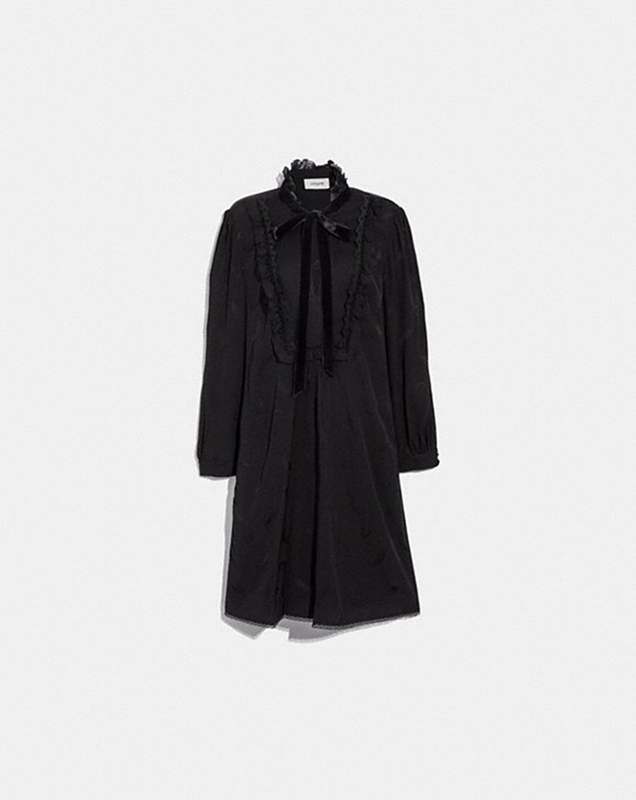 The jacket is made up of wool and leather, which features a signature stripped, ribbed trim. The Western-inspired rivets and pearly cabochons detail the sporty-yet-simple style. 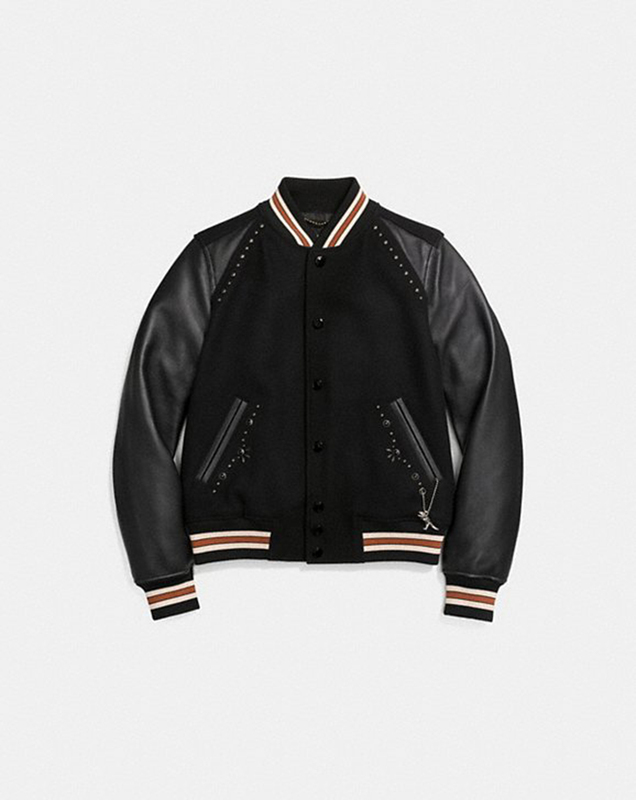 See it: Grab the Embellished Varsity Jacket (originally $850) now only $425 while supplies last, available at Coach! Not your style? See additional sale items available while supplies last, available at Coach!